We spent our time in Wanaka and in Nelson, both on the South Island, so my comments may not be correct for other areas, but here goes anyway. New Zealand doesn’t have the best roads for cycling. There are few shoulders, and most of the roads I’ve seen have a chip and seal surface, with big chips. When I first saw the roads I wanted to ride I feared the riding would be rough and bumpy, but you get used to the surface and it’s not nearly as bad as it seems……. except for the fact that the road people keep redoing sections of road. You can be riding along on a relatively nice surface and then come across a long section of road that has been recently redone. Depending on how recently the chips were put down, this can feel anywhere from a very rough ride, to a very scary ride as you pedal or corner through gravel that has not been fully packed down. The scariest section of newly chipped road I rode was going down the switchbacks on the Crown Range Road towards Queenstown. To my horror there was a new sign saying the road had just been chip and sealed. Riding down was scary, with my bike feeling a little out of my control in the new gravel. Fortunately only two sections of the road had been chipped. Riding back up wasn’t as scary but it was unpleasant riding. We saw very few pure road cyclists – people on lightweight road bikes. Cycling down the length of the country seems to be the most popular form of road cycling and most cyclists we saw were on touring bikes sporting big panniers, carrying all their gear for days or weeks on the road. Most of the people we talked with had tents and sleeping bags, but a few were staying in hotels. But even they were carrying big panniers with clothes and wet weather gear. Cycling on dirt tracks seems to be the big push, with the New Zealand government opening up old railroad grades and other flattish tracks down the length of the country. I suspect that having a cross bike or a mountain bike might be the way to go to take advantage of the big network of these tracks. You can pick up a copy of AA Traveler’s “The New Zealand Cycle Trail Guide 20xx” which contains lots of information about cycling trails in the country. This is a great ride. Both sides are good, but the direction from Queenstown to Wanaka is the best as it’s more varied and has more bends. I did it both ways, starting at Cardrona on the Wanaka side, riding over to the base of the switchbacks on the Queenstown side, then back up. The Cardrona side climbs gradually up the valley, very easy gradient at first, then steeply up the final few kilometers. My Garmin was showing a consistent 12% with patches of 13-14%. I’m never sure how accurate these GPS-based inclinometers are though, especially when you are moving slowly. Coming back from the other side you start with many lovely switchbacks at a fairly consistent 10% grade, for about 3 km. The road then levels off for maybe 4 kilometers before rearing up for another 4 kilometers. This part is considerably steeper than the bottom part and my Garmin registered plenty of 12-16%. While I can’t vouch for the accuracy of my Gamin, the climb certainly feels steep. 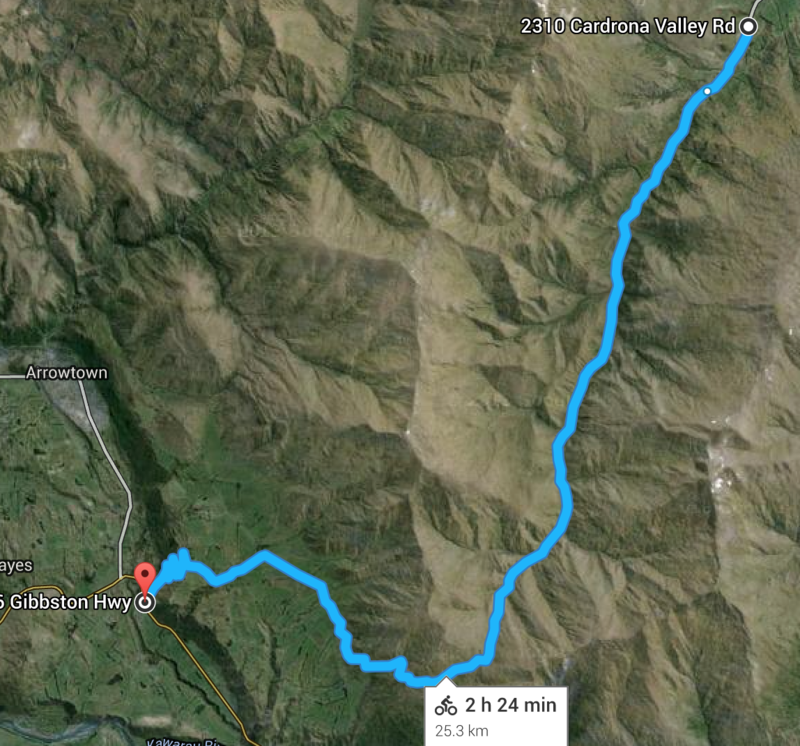 According to the signposts, Cardrona to the bottom of the switchbacks and back is 54 km, or about 34 miles. Well worth doing because of the great climbing. This is a very enjoyable, very rolling ride from Albert Town up the west side of Lake Hawea to The Neck (where the road changes from running along Lake Hawea to running along Lake Wanaka). The out and back ride is 69 km (43 miles) and has about 2,800 feet of climbing. As you can see from the profile, there are lots of rollers – the profile shows out and back. 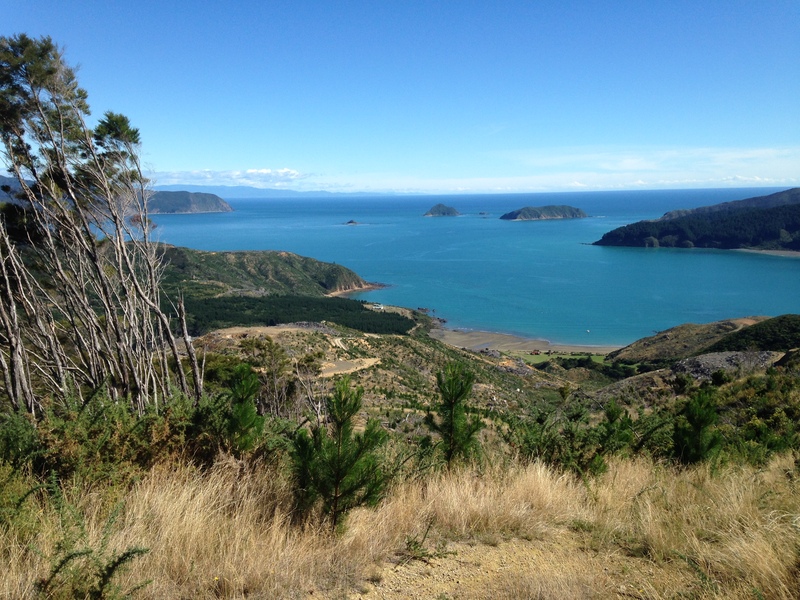 If you want a longer ride you can continue along the road to Makarora, which makes the ride 120 km (75 miles). The last few miles into Makarora are very flat so a more interesting ride is to turn around at the end of Lake Wanaka. 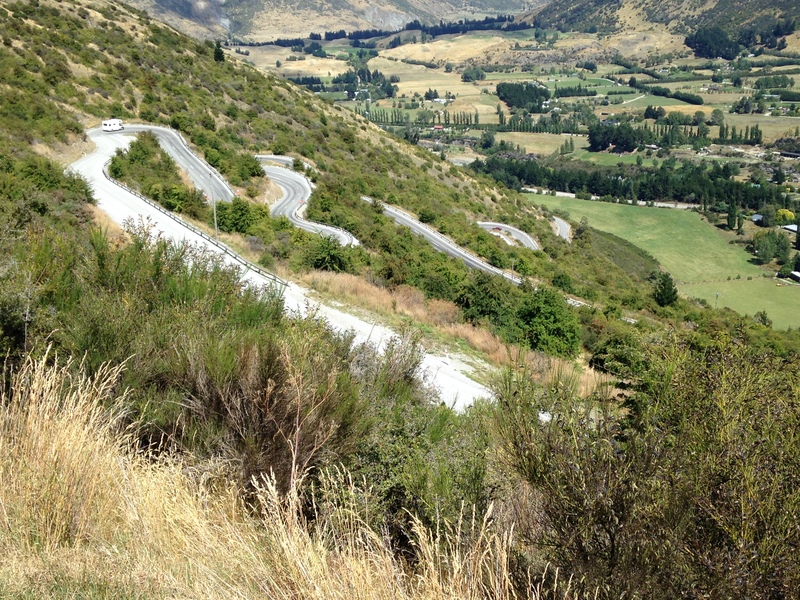 New Zealand has a lot of rolling roads but not many big climbs (at least in our experience.) 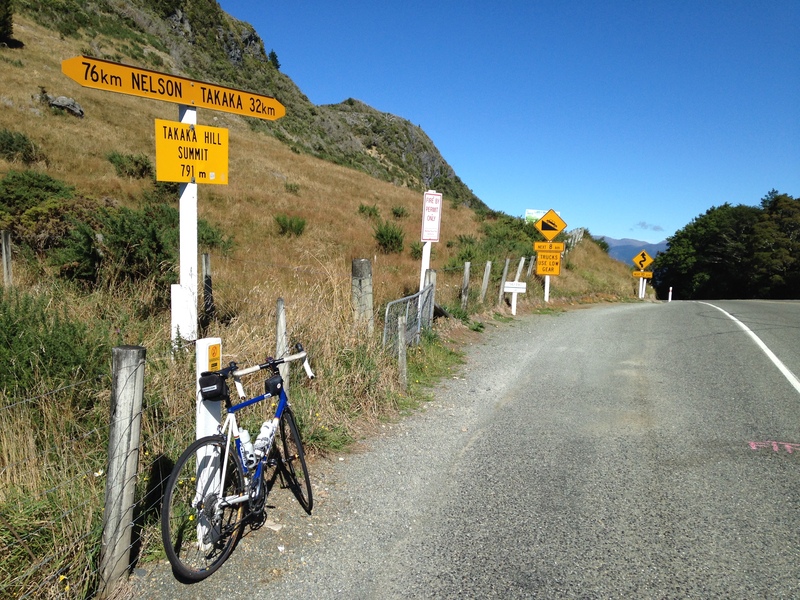 Haast Pass is one of those few roads that has a good climb. From Makarora it’s a 60 km out and back with 3,350 feet of climbing (according to Google.) The road is fairly flat from the Makarora Visitor Center for about 15 km, and you could drive another 8 km to the Blue Pools parking area if you want to avoid some of the flats. Then there’s some climbing but nothing significant to Haast Pass. From there, a few more miles of gentle downhill and flats lead you to a big fast descent. At the base of this you cross the river on an impressive one-lane bridge then do a few more gentle turns. When you’ve done enough flat, turn round and climb back up the big hill, then ride back to Makarora. A lovely ride over some very pretty country. The lollipop part of the ride is very quiet and peaceful. From Wanaka, drive south on Highway 6 and turn left on Highway 8A, just south of Wanaka Airport. Follow 8A for 2 km and cross the Red Bridge. Park in the large parking area where 8A turns right just after the bridge. Follow 8A for about 19 km until it joins Highway 8 just south of Tarras. Turn right and head south on Highway 8 for about 6 km. Just after you cross the Lindis River, turn left onto Ardgour Road. Follow this for 12.7 km as it curves east then north then west to join Highway 8 again just north of Tarras. Head south past Tarras (where there is a nice cafe should you want to stop for a coffee) then turn right on Highway 8A and follow this back to the car. 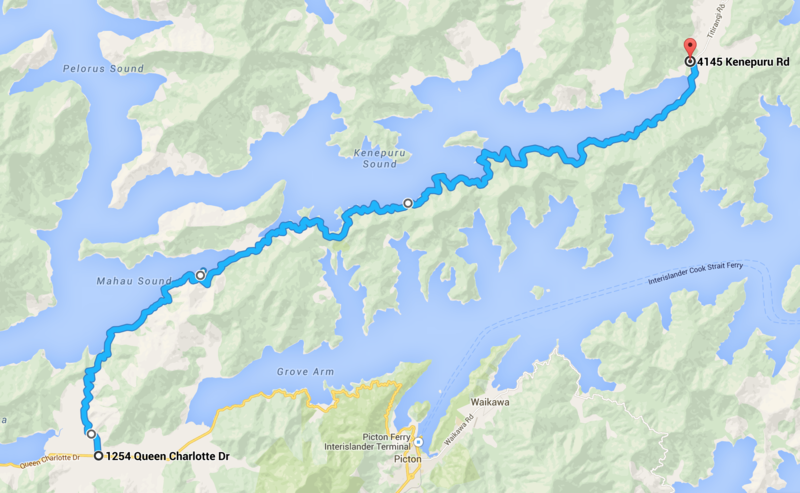 The whole ride is about 58 km and obviously you can make it longer by starting in Wanaka or some other place. 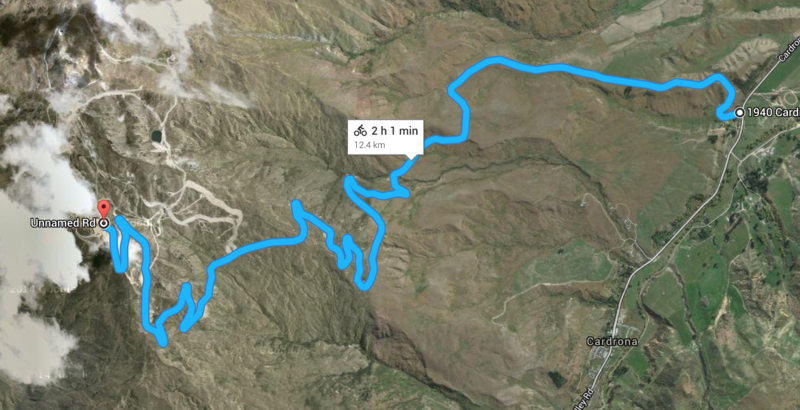 You can also add a short steep hill by turning right onto Ruffell Road, about 5 km after you start Ardgour Road. Ride steeply up Ruffell Road until it levels off after about 1.2 km. There are three ski areas near to Wanaka: Treble Cone, on the Mount Aspiring Road, and Cardrona Alpine Resort and Snow Farm, both near Cardrona. Treble Cone and Cardrona Alpine Resort are downhill ski areas, while Snow Farm has a network of X-country ski trails. All three areas are accessed by dirt roads with lots of switchbacks. 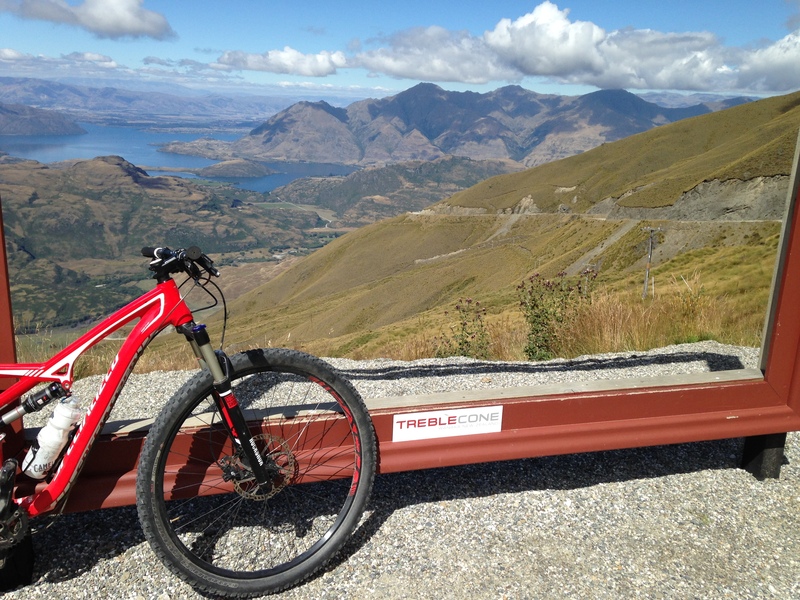 I rented mountain bikes from Outdoor Sports in Wanaka and rode up all three, driving to the starts of the climbs. Treble Cone is the shortest but steepest ascent. My favorite was the climb to Snow Farm, partly because it was the most scenic and partly because the road was the best – wide and not as steep. The climbs to Snow Farm and Cardrona Alpine Resort start almost opposite each other and it’s worth doing both in the same day. All the distances and elevations gains are from Google Maps. A tough mountain bike ride on very steep gravel. The ride is about 7.5 km with 3,031 feet of climbing. It starts where the Mt Aspiring Road turns to dirt, about 21 km from the intersection of Ardmore and McDougall Streets in Wanaka. This ride is about 12.4 km with 3,684 feet of climbing. It starts about 2 km north of Cardrona, and about 200 meters north of the road up to Snow Farm. A good ride to combine with Snow Farm. This ride is about 13.7 km with 3,333 feet of climbing. 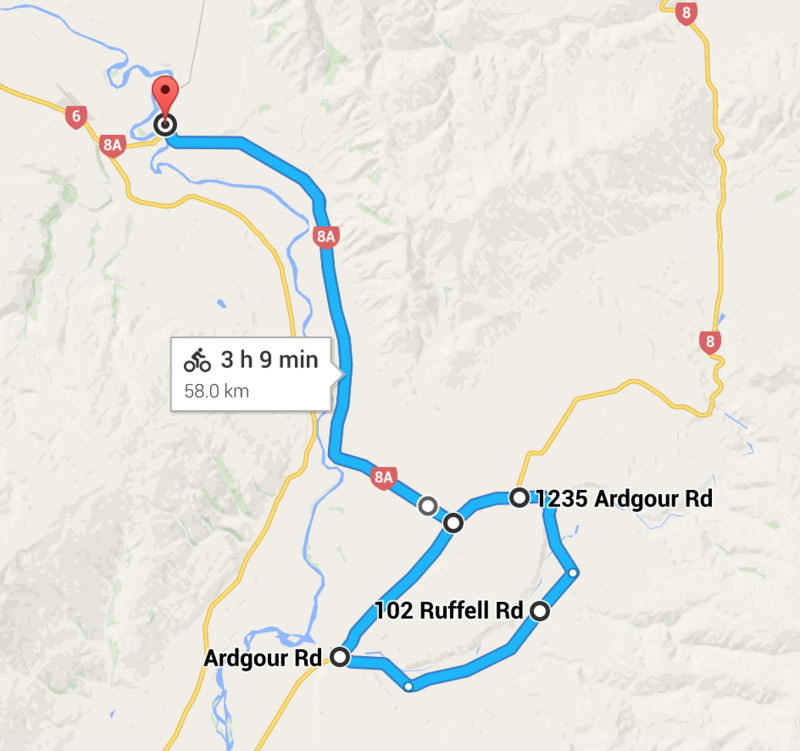 It starts about 2 km north of Cardrona, and about 200 meters south of the road up to Cardrona Alpine Resort. It was my favorite of the three because the road is wider, less steep than the other two, and with a more compact road surface. A good ride to combine with Cardrona Alpine Resort. Nelson has bike lanes, although many of them are along very busy streets, which rather detracts from the riding experience. Still, they are the only bike lanes we’ve seen in New Zealand. Nelson is filled with short, very steep hills. On a gray day when I didn’t want to do a long ride I decided to see if I could do 2,000 meters of climbing, without repeating hills. There are far too many roads to name them all, but I started with Arapiki Road and Panorama Drive/Citrus Lane to the west and finished with Cleveland Terrace and Atmore Terrace to the east. In between I climbed almost every steep hill I could find. I ended up climbing 2,160 meters (7,087 feet) in about 60 km (37 miles). Perhaps the steepest climb of any length was the upper, residents only section of Arrow Street. The southern end of Collingwood is perhaps a little steeper, but is too short to qualify. I rode the Nelson hills a second time on another gray day, and found a few more hills to climb. This time I climbed 2850 meters (9,350 feet) in 77 km (48 miles). Quite a day! This is perhaps the best climb in New Zealand South Island – at least it was the best climb I did – and both sides are good. The eastern side is longer and more twisty, while the western (Golden Bay) side is more alpine, with big, long switchbacks. I enjoyed both sides but my favorite was the Golden Bay side as the views are better and I liked the alpine feel. The whole ride, doing both sides, is about 54 km (34 miles) and has about 5,662 feet (1,726 m) of climbing according to Google, or 5,204 feet according to my Garmin 500. According to my Garmin the ascent from the east was 2,677 feet (815 m) and from the west was 2,260 feet (689 m). You’ll notice that the figures don’t quite add up, and don’t match the summit elevation of 791 meters. This is because there is some rolling terrain near the summit that adds a few feet on the eastern descent. There used to be a time trial up Takaka Hill, called the Marble Mountain Challenge, although I couldn’t find any references to it for the last 5 years. The fastest time I found was 38m 56s from the north end of Riwaka – this is vastly faster than I was able to go! I started about 2 km north of Riwaka at a huge parking area on the right side of the road, by a large flat field. It’s a couple of hundred meters before the bridge across the Riwaka River. From here, head north then turn left onto the Takaka Hill Highway. Follow this as it twists and turns to the top, about 17 km from the parking area. Ride down the big switchbacks on the Golden Bay side for about 10 km to where the road flattens and there is a big red building, and a road heading off to the left with signs for Aaron Creek Road and Cobb Valley Road. Turn around here and climb back up the switchbacks and head down the twisty descent back to your car. You can ride as far as you want on this road. I chose to simply ride 50km out for a day of 100km. This gives you three hills to climb: the short steep hill to Gentle Annie Summit, the big hill (which didn’t have a name at the top), and the middle sized hill of Rai Saddle Summit. According to Google, you climb about 1,530 meters (5,020 feet), while my GPS recorded only 4,093 feet. I’ve ridden this road at the weekend and during the week, and strongly recommend doing it at the weekend. During the week there are a lot of big trucks on the road, most of them long trailer trucks, many of them carrying logs. It can be terrifying being on curves as these trucks thunder past. This is a wonderful ride on a very quiet road with lots of climbing. From the turnoff from Highway 6 between Nelson and Havelock the ride is about 80 km (50 miles) with 1,700 meters (5,577 feet) of climbing. Drive from Nelson towards Havelock, and after the bottom of the third hill (Rai Saddle Summit) drive 2 km to where a sign points left to French Pass, Tennyson Inlet, and Okiwi Bay. This is about 40 km from Nelson. Turn left and park either in the public area on the right or just in front of the big sign showing all the possible destinations. Ride the road up the valley, over a big hill, and down to the small town of Okiwi Bay. This is a good ride by itself (45.4 km round trip with 785 meters (2,575 feet) of climbing.) From Okiwi Bay ride along the sea front and continue climbing up to the ridge line. Follow this with beautiful views into Croisilles Harbor and Squally Cove, where you can see several mussell farms. Continue down to where the road splits, the dirt road continuing to French Pass and the paved road heading down to pretty Elaine Bay with spectacular views of Tennyson Inlet. This is a lovely ride along Queen Charlotte Drive. 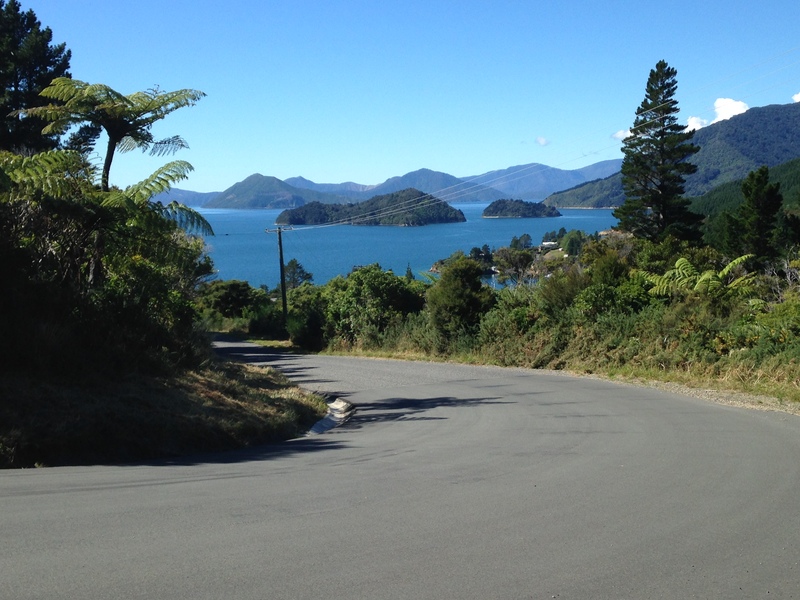 The views into Queen Charlotte Sound are beautiful, and the road is wonderfully twisty on the hills on both ends, with a long flat section in the middle. The road was free from big trucks as these go to Picton via Blenheim to avoid the very twisty coast road. We parked at the side of the road a few hundred meters after the turnoff towards Picton. The ride from Havelock to Picton and back is 66 km (41 miles) with about 900 meters (2,953 feet) of climbing. 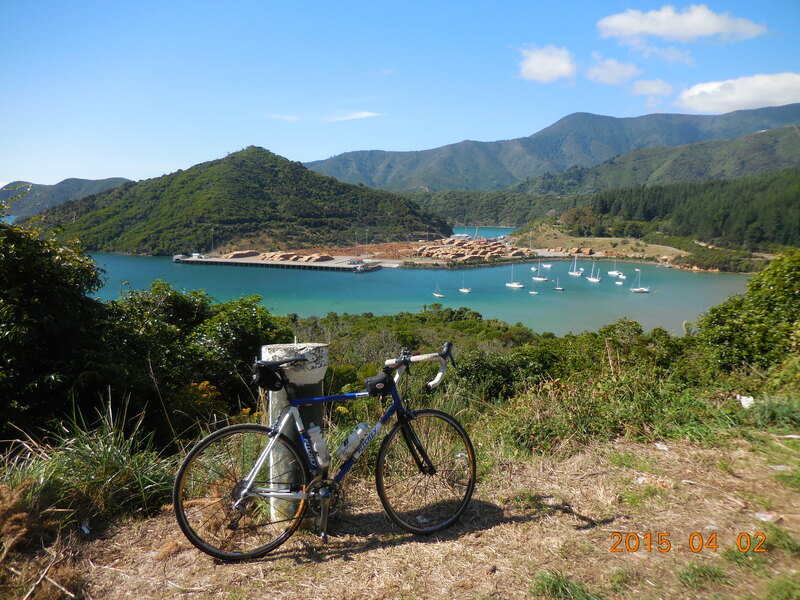 This ride pretty much parallels the Queen Charlotte Track as it twists its way along the shore of Mahau Sound and Kenepuru Sound. Despite the wonderful twisty, rolling nature of the ride, I think it is more impressive on the map than in reality. This is partly because you don’t get many good views of the water as there are trees and bushes along most of the road. And partly because there are long stretches of rough chip-and-seal. Another thing to be aware of is that when the sun is low, the road is covered with dappled shadows, making it difficult to see all the turns, and presumably making it difficult for drivers to see you. My Garmin 500 recorded 85 km (53 miles) with 1680 meters (5,512 feet) of climbing for the out and back ride. 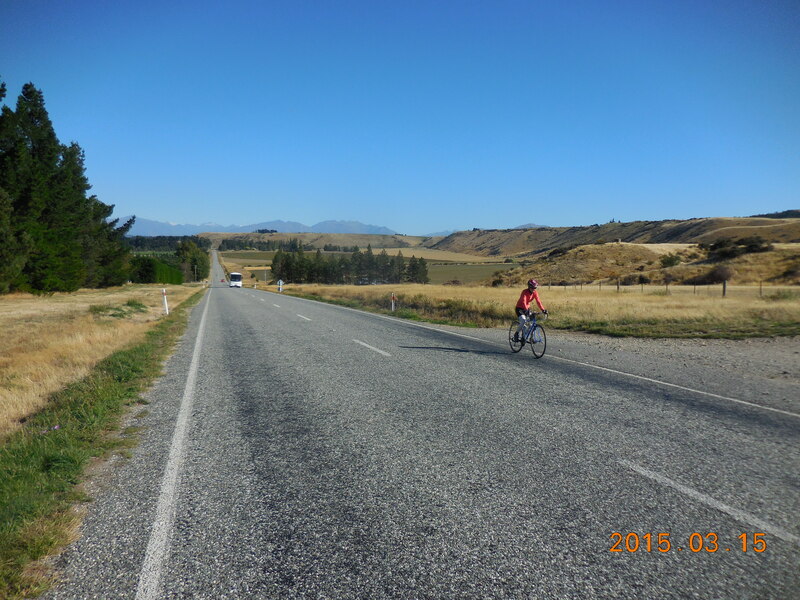 There is some wonderful cycling on the Moutere Highway towards and around Upper Moutere. The is not much traffic and there are some good rolling hills. Plus there are lots of quiet side roads that you can explore. 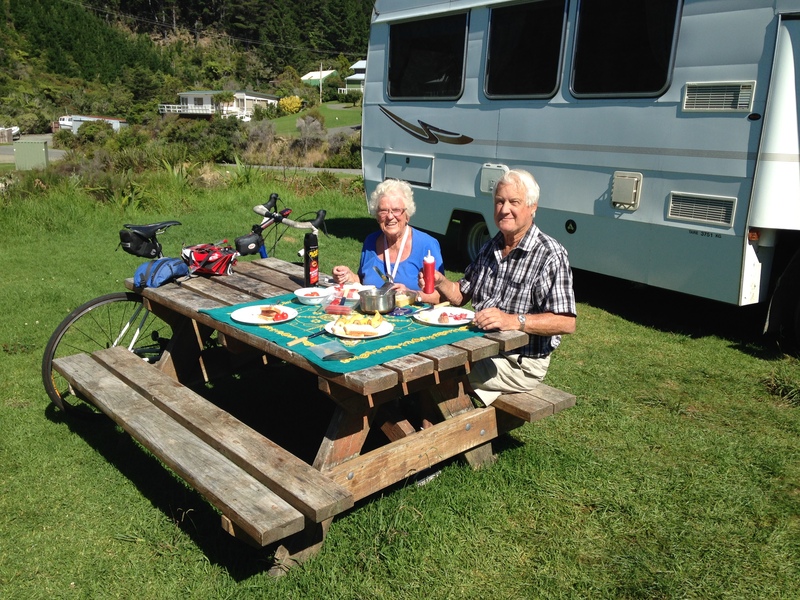 One set of side roads that we liked was to take Gardner Valley Road followed by Seaton Valley Road over to Mapua Wharf, where we ate fish and chips at The Smokehouse, followed by real fruit ice cream at Hamish’s. Life is good. Additionally, Old House Road has a short but very steep hill, Neudorf Road continues for quite a distance, while Sunrise Valley leads to a Buddhist Meditation Center. There are some group (bunch) rides that start just down the road at Village Cycles at 301 Queen Street, in Richmond. 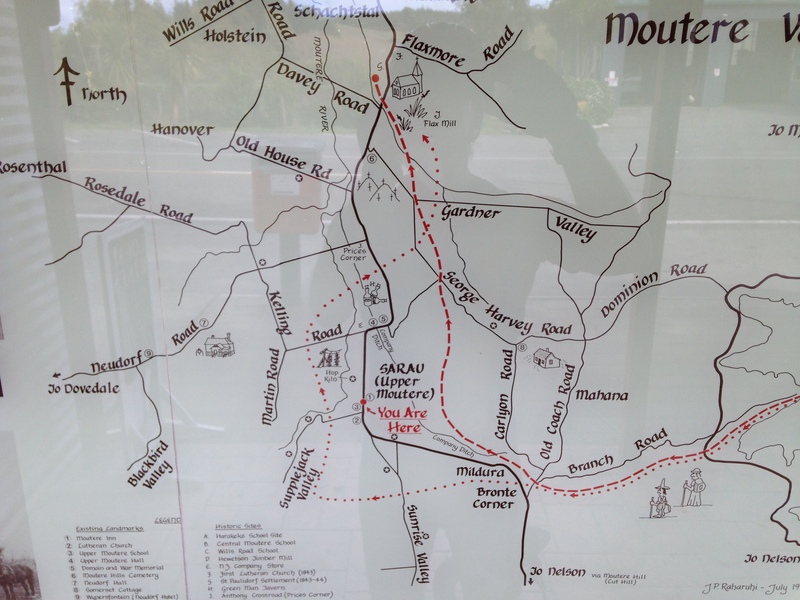 Tasman Wheelers used to have a Sunday ride that did a different route each week of the month – here is a description of the different routes. But as of the time I wrote this (April 2015), they no longer do the rides. Check here for the latest information about Tasman Wheelers bunch rides. I read about some other good climbs but we didn’t visit these areas. I’m including them here because if you found this page, you probably want to hear about them. 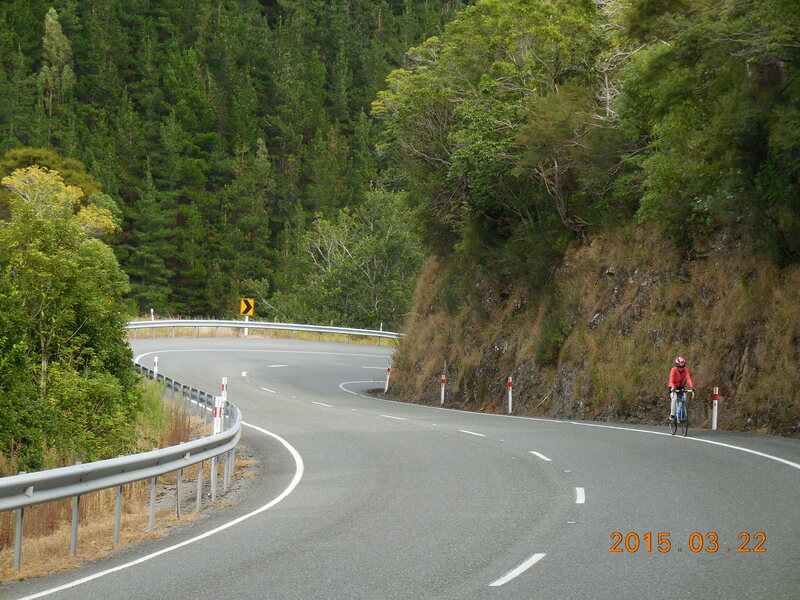 The Mountain Road from Ohakune offers New Zealand’s only “Hors category” climb. The 17km sealed road rises just on 1000m finishing in the carpark at Turoa skifield at an altitude of 1680m. The spring summer and autumn provides the best times with light traffic and moderate temperatures. The record is 44 mins 7sec set during the Kune Climb 2011, which is part of the Ruapehu Cycle Classic held in February each year. Enjoy the exhilarating descent back to Ohakune, but make sure you have adequate clothing/base layers as even in the height of summer there is a significant wind chill factor on the descent. I found the above description here. Lighthouse Road. Located behind Akaroa, this climb starts at the intersection with Onuku Road and finishes where the road turns to gravel. Don’t be fooled by the relatively short distance of 2.9km as with a brutally steep average gradient of 14.6% this climb will take a while. Great views of the Akaroa Highway the whole way up, unfortunately I was too busy concentrating on maintaining forward momentum to notice. Guaranteed to have your legs, lungs and arms burning by the summit. The above description is from a great web page that describes the Top 10 Climbs around Christchurch. I wish I’d seen this page before – we might have spent some time in Christchurch. 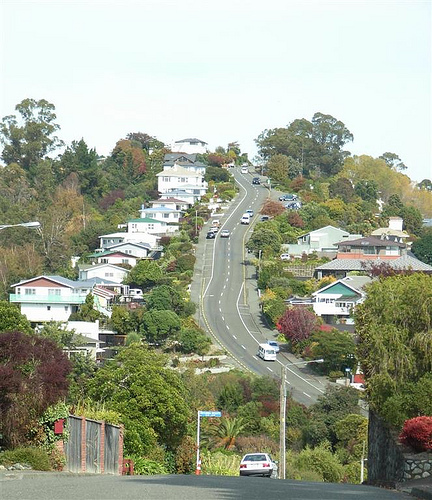 According to Wikipedia, “Baldwin Street, in Dunedin, New Zealand, is the world’s steepest residential street. It is located in the residential suburb of North East Valley, 3.5 kilometres (2.2 mi) northeast of Dunedin’s city centre.” You can find videos of people attempting to ride up Baldwin Street on Youtube. The great German racer, Jens Voigt, has written about racing over the Crown Range Road. A page about the cycling trails in New Zealand. Natural High can help you with all sorts of planning and logistics if you want to cycle tour.